you may become very uncomfortable. for an exciting Discovery is about to be revealed to you. By wishing well, wisheth living ever. That begetter of all happinesse. which are contained in the nearly 400 year old collection of poems written by "William Shakespeare". were part of an intricate and deliberate design by William Shakespeare. Light-of-Truth.com will merely show them to you from that perspective. In fact, you are encouraged to make your own interpretations of the numbers that will be shown to you. Any "rational Human-being" would certainly dismiss the following examples as pure coincidence. Light-of-Truth.com will present one "possible" theory. but may one day be widely Known as the only accepted Truth about these Sonnets. reveals an interesting design with great Rosicrucian significance. and 15 columns of numbers which go up to 365 that correspond to those letters. futhermore the "U" and "V" are used interchangeably. "Simple", "Reverse", "Short", and "Kaye" ciphers. you might ask, "What we should do with them?" Which spells out the word: "KEY". Where does this Key come from? It is the theory presented by Light-of-Truth.com that these Tables were designed by John Dee. and an important 16th Century mathematician. esoteric book of 1564 called, "Monas Heiroglyphica". may use these cipher methods to place a "signature" into their creations. that was used in Elizabethan times by John Dee and others, including William Shakespeare. and reveal many historic and little known facts about the times in which these Masters lived. Let's look to Shakespeare's Sonnets, OK? Line 188 of the Sonnets is line 6 of Sonnet 14. There we see two Dee cipher numbers, 14 and 188. "N A B O N P"
which is the Simple Cipher number of "John Dee". Now if the words of these lines are related to Dee would you be surprised? Remember line 6 is Line 188 of the Sonnets. Do those lines sound like they are hinting at "Prospero"? O, it is monstrous! monstrous! Is "Prospero" representative of John Dee? 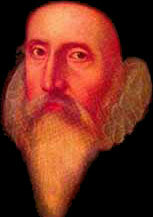 It is commonly accepted that "Prospero" was based on Elizabeth's astrologer, "John Dee". Surely the first 6 lines in Sonnet 14 are referring to Dee then. and the Kaye Cipher of John Dee is 188.
we find that both numbers reside in the row, "F". "FRom fairest creatures we desire increase,"
Is this a possible "signature" for John Dee using the very first letter of the Sonnets? but why would he put so much work into something to just give them away to "Shakespeare? What has Dee to do with Shakespeare anyway? And what "Princes" does he say if it shall go well? and will teach the Truth Seeker how to make their own discoveries. but forgotten secret lessons and incredible surprises to those who take the time to search for them. but will not give up all the secrets so far discovered by this writer. To do so would be to take away from you one of the most exciting adventures that a Truth Seeker may ever undertake. even though not pointed out by Light-of-Truth.com. to lead you to a Higher Understanding of Shakespeare, the Universe, and yourself. and the text of Shakespeare's Sonnets with their appropriate total Line numbers. Set your screen resolution to 1024 x 768 or better for optimum viewing.